7.80 points at 15 votes (rank 127). In the Latiy system, a solar system in a faraway galaxy, an old civilization at the age of millions of years exits which has developed the ability to look into the future. Unfortunately, the future for this race does not look good, because they see the total destruction of the system. A huge fleet of another race, the so-called "Salamander" is on its way. So a spaceship is sent out with the mission to scout the fleet and you are its pilot…. It all starts in level 1, a horizontally scrolling vault inside an asteroid, in which hostile forces have entrenched themselves and attack formations of ships. By destroying complete formations you can collect extras that improve your ship or raise the speed. At the end a huge brain waits for you and blocks the entrance to level 2. This level, scrolling vertically from top to bottom, takes place in free space and comes up with innumerable throngs of spaceships and indestructible meteorites. At the end of the level, a spider-like, revolving spaceship waits for you which has only one weak point: The entrance on the lower side is secured with boards that can be shot through. Level 3 scrolls horizontally again and consists mainly of a lava corridor where fountains scale off from ground and ceiling. Furthermore, the eponym of the game can be found here, the huge snake going in circles, whose weak point is the head. Level 4, the last level scrolls vertically again, over technical premises. After two intermediate bosses and a very well secured zone you finally reach the mega bomb that is intended for the solar system of the Latiy. You need to destroy all four supports to trigger it and with this destroy the hostile fleet with their own weapon. The game only counts as positively finished if you make this, only then the right end screen is shown. In every other case you only get a "Game over" message. 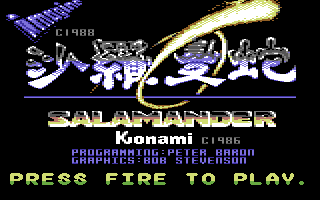 Salamander is a very exact conversion of the arcade machine, a partially horizontally, partially vertically scrolling space shoot-em-up with four long levels that have different graphics and different collectable extra weapons and on the end of each there is the obligatory end boss. The controls are very exact. The hostile attack waves are always at the same position and by this can be learned. 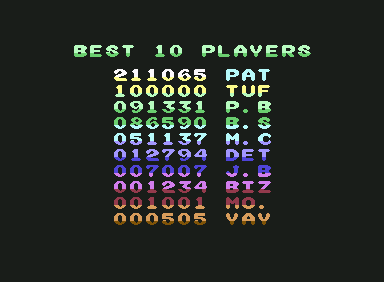 There is a highscore list in the original version which is, however, not saved. The original title of the game is 沙羅曼蛇, which is (for Japan) an unusual phonetic diction of the word "Salamander". The last character means "snake", the others were only chosen due to their pronunciation. 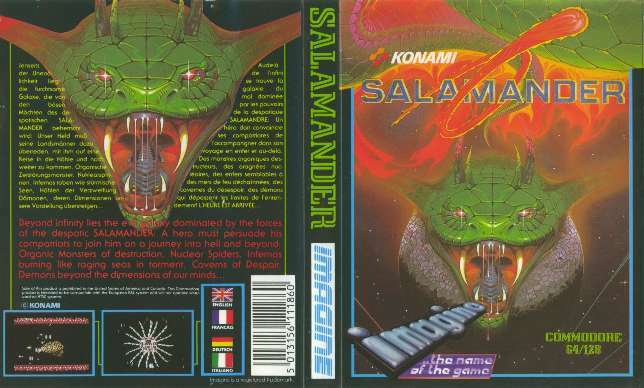 At that time, the game was renamed to "Life Force" for the American market, while it came into the game halls in Europe under the original title "Salamander". You steer with the joystick in port 2. The keyboard is only used to switch the music on or off and to abort the game. Extras are released when a complete enemy wave has been destroyed. Each type of extra has its own symbol, you instantly recognize its function. An extra is upgraded if you fly over it with the spaceship. After upgrading with 3 power multipliers and one wave laser, you own a fort bristling with weapons. When all ships of a hostile attack wave are destroyed, a bonus symbol appears that can be collected. Do not collect too many bonus symbols for speed, or else your spaceship will get too fast and with this almost uncontrollable. At the end of the last level the four supports of the mega bomb need to be destroyed the see the correct end screen. However, for this you need the right type of weapon. 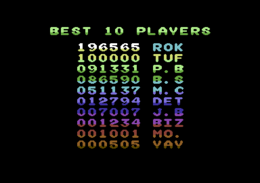 The version by "Nostalgia" has next to different trainers also a saveable highscore list. Rockford: "I can remember that I liked to play Salamander in the earlier days, mainly due to the good controls, the fair collision query and the good graphics, which however seem to me very jittery now. The first level seems a bit too slow, in the second there is a bit more going on, but it is too much plain vanilla. I have not seen more levels until now. I give the game a good 7 for now before I might be able to get a bigger picture of it. Addition: now played until level 4 (or so), the further levels do not bring anything exciting, except for the graphically impressing third level. After the first two levels everything seems to me rather short and unimaginative. The end bosses are ridiculously easy – even I have managed to defeat them! I stay with 7 points." Salamander in the Killer List Of Videogames. This page was last modified on 7 April 2017, at 19:23.